Mary Pickford approaches the baptismal font in 'Tess of the Storm Country' (1922). 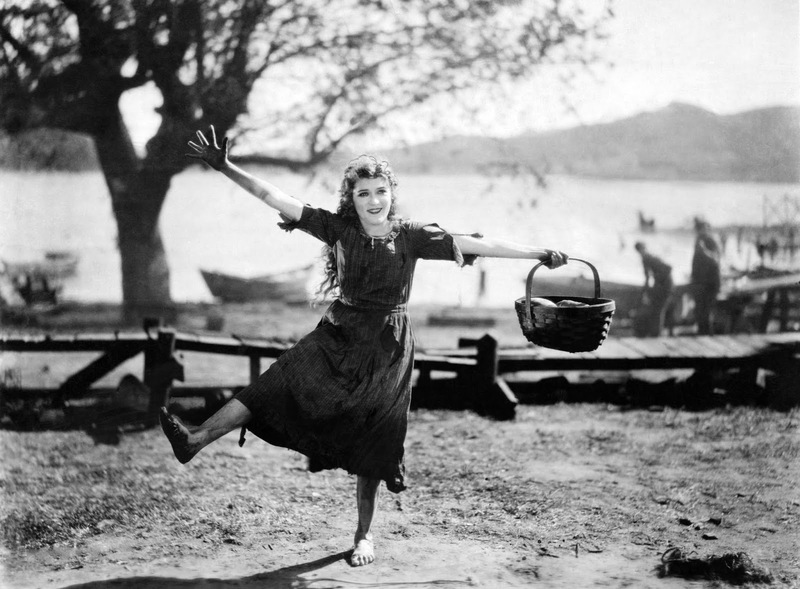 A full century after they were made, silent films attract an audience for reasons that are many and varied. A cousin of mine attends because he's into antiques. He likes seeing chairs and tables and whatever else was in people's homes back then. But last night, I was reminded that not all reasons are created equal. 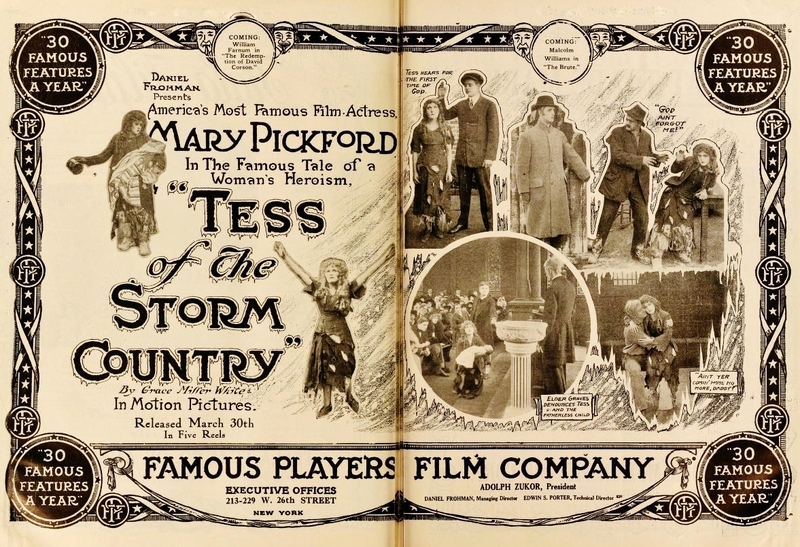 We had just finished screening 'Tess of the Storm Country' (1922), a great Mary Pickford melodrama, as the main attraction of a "Christmas Past" program. Our audience at the Flying Monkey Moviehouse in Plymouth, N.H., seemed to enjoy it. Afterwards, I asked for questions and comments. Mary Pickford in 'Tess of the Storm Country' (1922). I guy I'd never seen before raised his hand. "That film showed the America that USED to be!" he said loudly. I didn't understand quite what he was getting at...maybe how times were simpler and people knew their roles? "Yes, yes," I said. "It was certainly another era." I mentioned something about how the rich family behaved like the Robber Barons of the Gilded Age (or today), and we moved on. But afterwards the guy came down to talk one-on-one. And he said it again, as if to congratulate me: "That film showed the America that used to be," he said, and then continued. "You know, all the original 13 colonies were founded because of religion." Ah! That's what he was getting at. He likes his America heavy on Christianity, and here was a film that showed the good old days when people feared and respected God as imagined in scripture. 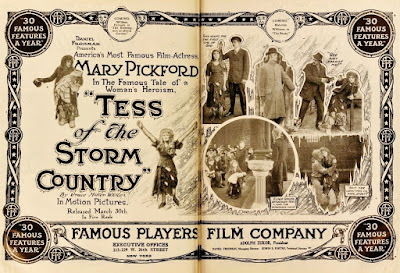 Like many films of the era, 'Tess of the Storm Country' is saturated with Christian imagery and suffused with a kind of of innocent, sentimental piety. This was seen as good box office: just look at Cecil B. DeMille's 'King of Kings' (1927) to see this principle used in the most cynical fashion, with the cast required to attend Catholic Mass every day on set. In 'Tess,' the whole story is told in a Christian framework of "Peace on Earth, good will to men." This is nice and fits the story its characters, and is one of the reasons it works as a Christmas movie, I think. Well, my new friend found that the world as depicted in 'Tess' matched the world he'd like to see in 2018, apparently. It's a world where rich and poor alike are subject to the judgment of Almighty God, and the fate of all was in large part determined by how dedicated they were to observing Christian scripture, i.e. the Bible. And he continued for a bit, lecturing me about how this country was founded on religious belief and faith in God and Jesus Christ, and so on. I like to think I'm tolerant of all points of view, and I'm grateful for any fan's support. But this guy irritated me, as he was taking this melodrama and reading into it so much that I felt just wasn't there. Also, he was using it to justify a misunderstanding of American history and civics that borders on religious bigotry, I felt. "But we have this document called the U.S. Constitution, which guarantees freedom of worship, so people of all faiths are welcome and encouraged to play full roles in society. Isn't that great?" We chatted for a bit more, and I can't recall his responses, mostly because I was tired, but also because I was no longer really interested in what he had to say. Also, he realized that he had mistaken me for a fellow traveler. When he found out that wasn't the case, he beat a hasty retreat, presumably because I might burst into flames at any moment. Like I said, people come to silent films for many reasons. But it's disappointing to me when the reasons involve an nostalgia for an imagined past that never was, or even worse, use them to support a worldview that endorses superiority of one religion over another. Full disclosure: I was raised in the Roman Catholic Church, but have since become a religious free-thinker. I'm officially a member of the Unitarian-Universalist Church in Nashua, N.H., but have no direct involvement in the church as even that is too structured for me. But I'm not an atheist. I find I'd like to someday take my life experiences and use them to create a spiritual system that reflects what I've encountered. I don't know for sure, but it'll probably revolve around recognizing human awareness as a sacred thing. A good example of human awareness is our ability to recognize paradox. What other being has the ability to recognize and contemplate a paradox? 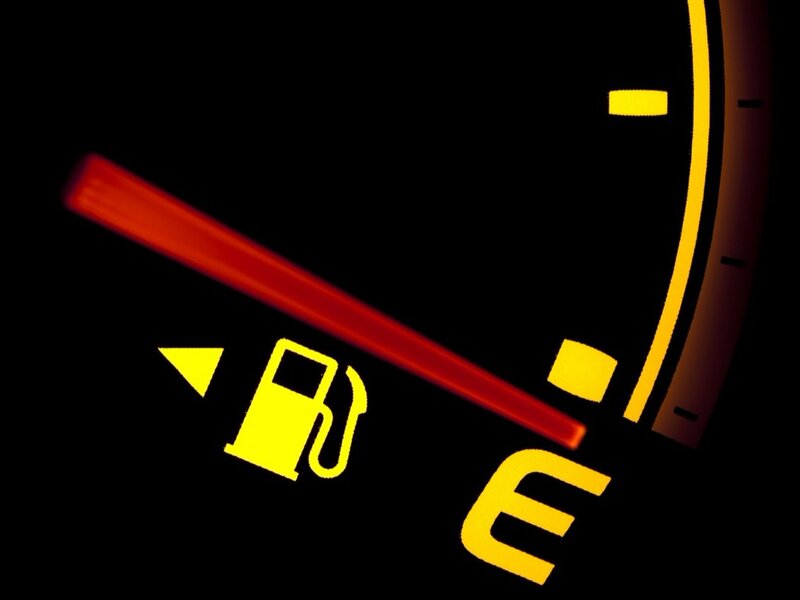 Consider: a gasoline tanker truck on the side of the road, not moving. Why? It's out of gas. Paradox! Speaking of out of gas, so am I. And it's a good time to be that way, as the silent film calendar is finally slowing down after a very busy Halloween / Armistice Day period. Coming up: a handful of screenings through mid-January, including a rare Russian film at an Academic Convention this Friday in Boston; Harold Lloyd's 'Grandma's Boy' (1922) next Sunday (Dec. 9) in Natick, Mass. 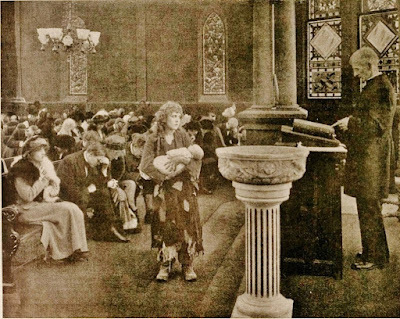 ; and D.W. Griffith's rarely screening 'Hearts of the World' (1918) on Dec. 30 in Wilton, N.H. Details on the "Upcoming Screenings" page. See you at the movies!